2016 Wine Trail Guides let you Sip. Snap. Share. 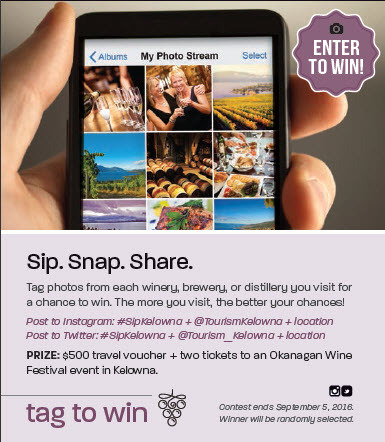 The 2016 Kelowna Wine Trails Guides arrived this week and there’s a cool new contest component that encourages people to take photos and share their experiences. The contest acts like a visual and sharable tour and tasting passport. There is one photo entry per location so the more stops a shutterbug makes, the more chances they have to win! Look for #sipKelowna on Twitter and Instagram this spring! We produced 200,000 of these popular guides for 2016 and the Tourism Kelowna team has already started distributing them to Central Okanagan hotels, attractions, wineries and hundreds of other businesses. Our ongoing contract with Certified Folders ensures that guides are also distributed throughout the rest of the Valley, British Columbia and Alberta. The 2016 distribution plan includes point of sale and in-store display campaigns in 18 specialty wine stores located in Calgary, Edmonton and Vancouver. The initiative kicks off in early April and runs for 4 weeks. The timing has been purposely planned to encourage spring travel for wine touring experiences. It will also encourage purchases of Central Okanagan wines and provide shoppers with a relevant (and beautiful) take-away for the wines they purchase. To continue to strengthen the local awareness of the many incredible wine-experiences available in our own backyards and encourage visiting friends and family winery visits, the guide will be again be delivered to the homes of residents in Kelowna, West Kelowna, and Lake Country. This delivery is being done in tandem with the Kelowna Capital News/Daily Courier so watch for a copy in your mailbox in April and just in time for Spring Wine Festival! The guides will be delivered to more and more local tourism businesses in the coming weeks but if you’re able to pick up your own supply and expedite stocking your business, please contact the Visitors’ Centre at 250-861-1515 to make arrangements. You can download the guide online by clicking here.